Lobbying government for a universal child care system; making it easier for women to join unions; initiatives to end violence against women; increasing maternity and parental benefits; and improving the economic equality of women. 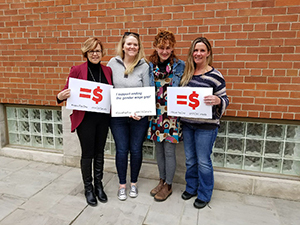 The UFCW 12R24 Women & Gender Equity Committee’s first actions will be participating in Equal Pay Day and reaching out to Local 12R24 members to hear which issues are most important to them. With respect to Equal Pay Day, the committee and The Beer Store have launched a joint initiative encouraging members to wear red t-shirts on April 10 in support of closing the gender wage gap. The t-shirts symbolize that women are in the "red" when it comes to equal pay, as they need to work 15.5 months to make what a man makes in 12 months. As well, UFCW 12R24 members will be surveyed at upcoming steward’s training sessions and conferences about the issues they would like to see the committee address going forward. Members are also encouraged to e-mail their ideas to the UFCW 12R24 Women & Gender Equity Committee at WGE@ufcw12r24.ca. UFCW Canada Local 12R24 represents over 6,000 employees working at The Beer Store in the province of Ontario. To learn more about UFCW 12R24, visit their website.